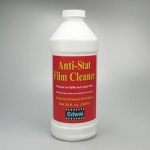 PEC-12, Photographic Emulsion Cleaner is a non-water based film and print cleaner which removes virtually all non-water based stains from color and B&W slides, negatives and prints. PEC-12 contains no water; therefore, it dries instantly with no emulsion swelling and leaves no residue. Completed details and instructions are provided at time of purchase. Since 1983, PEC-12, Photographic Emulsion Cleaner has been trusted by the world’s most prestigious photographers, labs, museums and publishers. Not only has PEC-12 saved many of their most valuable images; it is the ONLY archival cleaner available. What good is cleaning an image only to have the emulsion slowly deteriorate over time? PEC-12 is a non-water based film and print cleaner which removes virtually all non-water based stains from color and B&W slides, negatives and prints. In many cases, PEC-12 removes grease pencil, adhesive residue, finger oils, ball-point pen, fungus, smoke & soot damage, laser separation oil and most permanent inks. 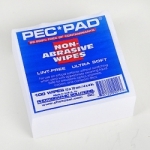 PEC-12 contains no water; therefore, it dries instantly with no emulsion swelling and leaves no residue. For working on larger films or prints, use the larger size PEC PAD or similar applicator. When using a PEC PAD, simply wipe it across the film/print. If using other applicators wipe the film lightly, turning the applicator to carry away the grime and bring clean PEC-12 to the emulsion. These other applicators will also require a final wipe with a clean applicator lightly moistened with PEC-12 to remove any lingering residue. The pad itself should look clean after this last application. In some instances, with slide or negative films, one may notice a slight coloring usually magenta (prints) or yellow/green (slides) being removed from the film and discoloring the applicator. This occurs because during processing the final wash tank was not supplied with adequate fresh running water allowing chemical carryover contamination. Any film passing through this wash is thus “contaminated” with residual chemicals. PEC-12 is removing this residual contamination from the film and actually improving image quality and permanence! 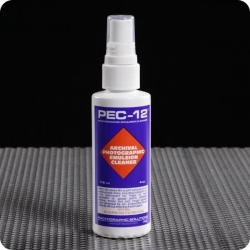 PEC-12 dissolves only non-water based stains. If it is going to work on a particular stain, it will do so immediately. If there is no immediate effect, DON’T apply any pressure to the print or film. That won’t work any better, and non-PEC PAD applicators can scratch the image. An exception to this is cleaning adhesive residues, which may require several applications, a heavier dose of PEC-12, or a combination of both. But DO NOT RUB HARD in attempting removal.